Well, dear readers, here it is: the craft fair advice post! I didn't know I had learned so much until I began to write it all down for you. A craft fair is a lot of work with a steep learning curve from start to finish! Here are my tips as well as my checklists, a few pictures, and some more resources at the end. I felt rushed to build up my inventory (because I only found out about the craft fair three weeks before!) so I spent very little time thinking about how my craft fair table would actually look. I should have designed my display on my kitchen table before the event so I could play around with spacing, props (like bowls or dishes or pretty trays), and even the amount of products I wanted to display. Therefore I only had a basic vision for my table and just played around with the design once I got to the fair. Since I had a couple of hours before the fair began, I could arrange and rearrange a dozen times. 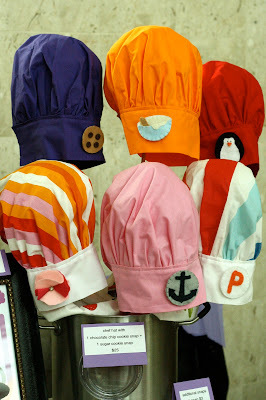 As you can tell from my photos of the craft fair, my friend Anna spent a lot of time thinking about her display and had some darling ideas and a beautiful vertical display for her chef’s hats. Her attractive use of space definitely drew customers in! She also had printed a larger version of her logo to hang on the front of her booth. Because Anna and I were sharing a table, we both had to crowd our displays in order to show all the items we offered. Considering this, we took a lot of care to make sure that all our items were grouped well and that we kept any extra inventory off the table to provide as much calming white space between items as possible. In the end our table looked rich with attractive choices but not overcrowded or overwhelming. We both encouraged people to interact with our displays and products, meaning Anna was happy for kids to swirl her whisk around a bowl with her felt sugar cubes and felt eggs. I also cheerfully suggested that people try on my gloves whenever they paused to look at them; I know they look so much more attractive on your hands than simply lying on a table. Most professional crafters will have invested in a professional designer create a logo for them. I haven’t done this yet, so I just made my own sign with the name of my shop, a tagline (“Knitted and Sewn by Becca Garber”), and the addresses of my blog and Etsy shop. In retrospect there were a dozen things wrong with my sign design (ie., it wasn’t colorful, the web addresses were long and distracting), but hey… better next time. I printed a sign with my shop name, tagline, and web addresses on fine resume paper and framed it in a picture frame we had in our house. I also printed “business cards” that looked exactly the same as the sign. These I printed on resume paper and then cut out myself with a craft paper cutter. The “price tents” were easy to make on Microsoft Word. I formatted a page to have two columns, typed up a product description and price in each column towards the bottom of the page, and then printed the page. I cut the page in half lengthwise—two strips of paper, each with a product description and price near the bottom—and then folded the strip in half and folded the ends underneath. I taped the ends together and this made a little 3-sided tent with the product description and price on the front side. These stood up well by themselves and didn’t lose their shape throughout the day. When I packed up after the show, I carefully peeled off the tape and smoothed the papers out. They’ll be used again! For individual products like a scarf or hat, I made price tags on fine resume paper and attached them to the product with a natural cotton yarn. I also made “original price tags” and then “alternative price tags.” The alternative price tags were $5 less for everything in case I decided to lower my prices to encourage sales halfway through the show. Kind of awkward to decide this and then have to rewrite your prices with a Sharpie. I made sure every sign was printed (no random handwritten signs) using the same type of font and the same kind of paper. This consistency gave cohesiveness to a table full of various products. It’s a nice touch to hand your customer their purchase in a pretty bag or box. I bought brown paper lunch bags at the grocery store; they were big enough to fit most of my products. I would have liked to glue on handles with a hot glue gun and twine, but I ran out of time. I did manage to use a hot glue gun to quickly attach my business card to the front of the paper bags, and that was a nice addition and guaranteed that my customers would go home with my card and all my contact information. I bought cute red-and-white-striped tissue paper to go inside each bag. This made the new purchase look more like a gift and reminded everyone that they were shopping for Christmas… yay! The first is receipts. Some customers might like a receipt of purchase, particularly if they just bought a large item. You can create your own in Microsoft Word or download a customizable template here. Secondly, if you are willing to offer custom orders, you might be opening yourself up to a whole new scope of your business. I was eager to offer custom orders on my gloves, particularly because I’d only had time to make three pairs before the show. Every time people showed any interest in the gloves I encouraged them to try them on and then pulled out a bag full of yarn so that they could imagine a pair of gloves in colors that appealed to them. This way I got three custom orders in a three-hour show, which is $75 I wouldn’t have otherwise made! I designed little custom order forms. Lastly, you will want to keep an inventory checklist so that you know what you’re selling. I made a nice one on Microsoft Word but ended up just keeping a running list myself of what I had sold and for how much. This tally of how much I had made thus far also motivated me to keep selling hard! I’m glad I have this record because my memory fades quickly and I’ll need to know these figures for taxes in April. By this I mean candy or cookies or your business logo stickers or whatever encourages people to come on over, snag a handful, and take a look. I wanted to accommodate all those who might be tempted by chocolate! I set out an attractive Polish pottery dish that matched my other display dish and filled it with Hershey’s kisses wrapped in Christmas-colored foil. These were a hit… especially with me. Your inventory with price tags either attached now or made to be attached later. I recommend packing everything in a rolling suitcase! Mirror so people can see what they look like as they try your products on! Cash—I had $20 in $10, $5, and $1 bills and it was more than enough as people began paying in cash immediately and bulked up my stash. I also accepted checks. A small table or a chair on which to place your cash box, paperwork, pens, and water bottle, as it’s awkward to have them on the floor and you need to use your table to display your wares. Food—consider including a full meal if you’ll be there all day, but also consider that the booth down the hall selling fresh Mexican street tacos might be calling your name! Also consider if you want to eat behind your table (not recommended for appearance’s sake…) and who will sit there in your stead while you go eat. Can your husband or a good friend relieve you for 30 minutes and also be trusted to bring in sales while you’re gone? Will you be taking credit cards? If so, and if you have a smart phone, you might want to look into The Square Register. A book I have loved for handmade selling and marketing advice is The Handmade Marketplace. 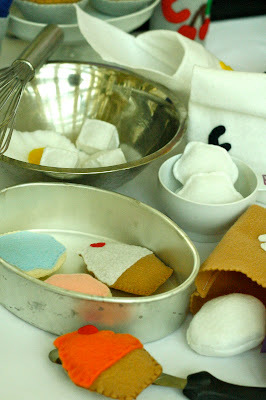 Carosello's blog post with craft fair advice was super helpful to me and Anna. OK, now go forth, craft, and sell! Wow, so very helpful! Thanks for all the specifics! This is such a helpful post!! If only I had the sewing skillz that you have! :-) Oh well... maybe someday! It gives all the more reason to admire the tons of work that went into the craft show! Whew! You are both a craftswoman and a sharp businesswoman. I remember those days when you were about 10 years old, and you stood in front of the shopkeepers at the bazaars in Pakistan, or Turkey. You bargained confidently with them.... clues even that you knew how to negotiate a deal. Great post! I don't frequent craft shows much, but when I do go I spend a lot of time thinking about how the sellers present themselves. Invariably it is the ones who have an attractive and engaging display that have the most traffic. It makes such a difference!